There are many ways to connect polymer clay beads to form a bracelet. My intention was to find a way to connect them that would offer flexibility and movement. That led me to the idea of using hinges between each. I originally was going to try to hide the hinges somehow but then I found these pretty gold hinges at Hobby Lobby and decided they would be a nice accent between the beads. 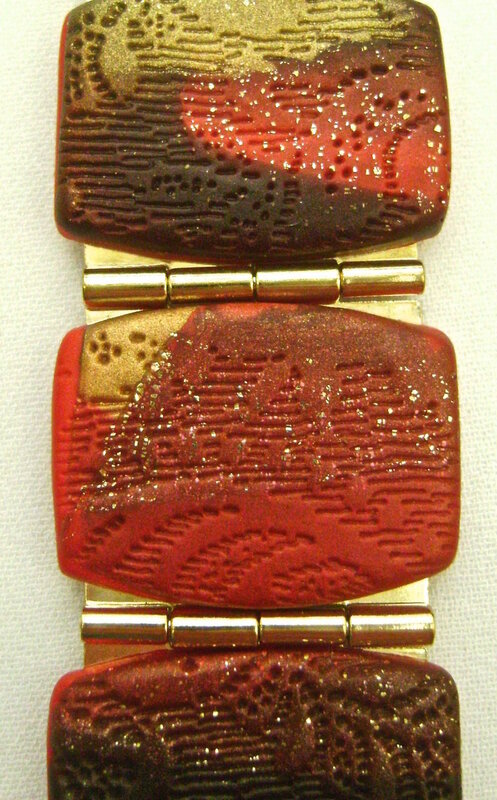 They also complement the metal gold foil imbedded in the beads and the gold clasp. I used Pomegranate, Gold, and Black clay colors along with Gold Leaf to match a shirt I’m making for the summer. Choose a mix of colors that appeal to you. I borrowed a custom made cutter to shape the beads. A rectangular shape cutter can be substituted. step 1 - Pass the Pomegranate clay through the conditioning machine on the# 1 setting. Put aside a 1.50” x 8” wide strip. step 2 - Roll the translucent clay on #2 setting. Apply the gold leaf to the clay by burnishing the leaf to the clay then peeling away the backing. Follow the package instructions. step 3 - Roll out the remaining clay colors on the #2 setting. Use a wave blade to cut 1/8” strips. Include the gold leaf clay which is not shown in this photo. 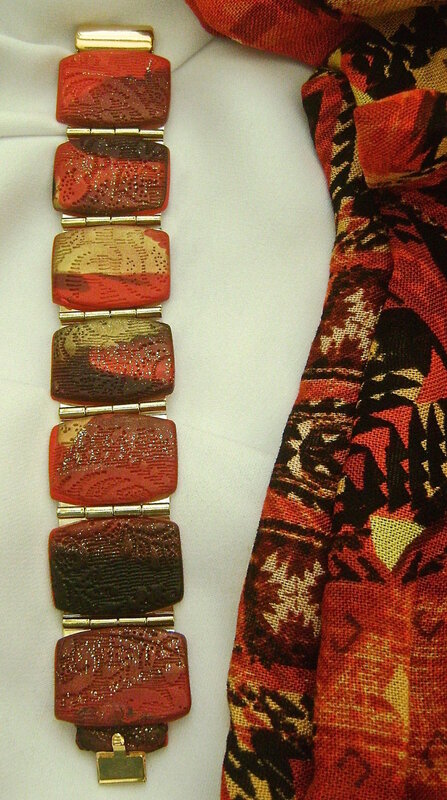 Fit them together like a puzzle alternating red, gold, black and gold leaf. Press on them so they stay together. step 4 - Pass the pieces vertically into the machine on # 3 setting. Fold the piece in half with the foil on the outside and roll again. Fold the piece horizontally and roll again. Keep passing the clay through the machine until you like the color mix. step 5 - Cut out the bead shapes. Position them on the strip of Pomegranate with spaces in between each. step 6 - Moisten your rubber stamp with water from a spray bottle. Press the stamp onto the beads. Use any size or design stamp as long as the pattern is small enough to cover the complete bead. step 7 - When you press the stamp onto the clay, you’ll notice the gold leaf suddenly becomes very visible. step 8 - Place plastic wrap over the work and make a final cut of the beads. The plastic will create smooth curved edges. step 9 - Arrange the beads face down on parchment paper or card stock. Place the hinges on the beads and the box end of the clasp at one end. Push the end of a knitting needle through the hinge holes and the clasp to make matching holes in the clay. Don’t go too deep. The holes should not be visible on the front of the bracelet. Apply a bit of liquid polymer clay in the holes with a pin or toothpick. Roll a bit of clay between your fingers and press it into the holes, leaving a small bit raised above the hinge. step 10 - Create small buttons to cover the holes with an Etch n’ Pearl tool. Press the buttons onto the hinges connecting them to the clay in the holes beneath. step 11 - The tab insert portion of the clasp must have free movement to work properly. If there is thick clay beneath it, you won’t be able to press the tab down for release. It needs a special clay extension to attach it to the bracelet. step 12 - Roll a Pomegranate piece of clay on # 2 setting. Cut the piece .75” long by .50” wide. Place the clasp on the clay with the holes lined up at the side edge. Apply liquid polymer to the clay. Cover the clay with a piece created in step 4 rolled out paper thin. step 13 - Press down on the tab to be sure the clay isn’t obstructing its movement. Coat the left edge with liquid polymer clay. step 14 - The bracelet should still be face down on the parchment paper. Press the extension face down onto the last bead in the strand. Flatten the thick end of the extension so it transitions more smoothly into the bead. The photo above shows how the finished extension looks right side up. step 15 - Place the parchment paper on a baking sheet and bake the clay at 275 degrees for 30 minutes. Hinges will be very hot. Allow the project to cool completely before handling. After I finished my bracelet my friend Donna, said, “You could have inserted the sides of the hinges into the sides of the clay beads instead of using your button method”. And she’s so right! If you choose to do that, keep in mind you will probably need to make the beads a little thicker. The beads in this project are less than 1/8” thick and that slim profile is something I really like about this project. Sculpey Clay - White Translucent 1/2 oz., Black 1/2 oz., Gold 1/2 oz., Pomegranate 1 oz.